Updated September 18 at 8:03 a.m.
After a number of dreamy social media teasers, Ariana Grande has confirmed an official September 23rd release date for her perfume named CLOUD Eau de Parfum. The fragrance, which will retail for $50, is now available to preorder on Ulta and will also be available to purchase in store. As her previous teasers would suggest, the perfume is centered on all things sky. Coming in a light blue bottle, the Cloud perfume sits atop a billowing cloud base, and features a lid with another small cloud. In photos shared to her Instagram stories, Ariana also shared that the bottle comes packaged in square box that features a neon-hued image of the singer. Ariana has been quite fond of all things related to the heavens. She previously posted cloud emojis on Instagram and also got matching cloud tattoos with partner Pete Davidson. Ulta notes on their website that the perfume contains notes of lavender blossom, pear, and bergamot. The heart of the perfume includes the scent of coconut, praline, and vanilla orchid. For the base, Ariana chose the scent of cashmere. The upcoming release will mark the singer's fourth perfume. 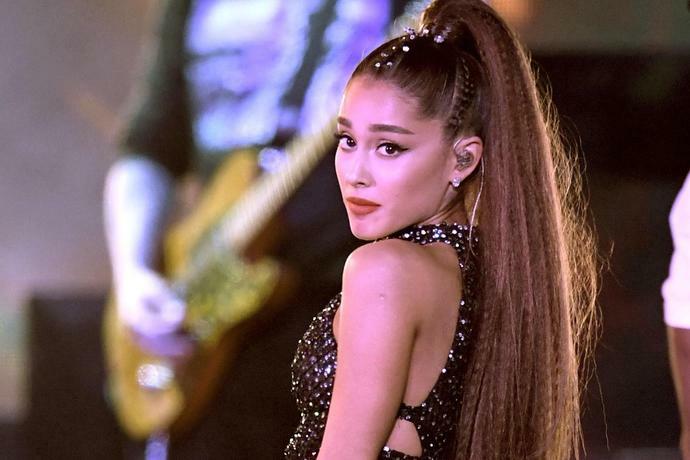 Between Ariana Grande's new song with Nicki Minaj and her rumored engagement to SNL actor Pete Davidson, it's safe to say that the star has had quite the busy month. And it just got even busier. On June 12, the "No Tears Left to Cry" singer posted a video to her Instagram Stories revealing a mysterious, cloud-shaped bottle, with text reading "New perfume coming soon ☁️," appearing at the end of the clip. Fans will immediately recognize the emoji as one that both Ariana and Pete got inked on their fingers. Additionally, the singer has taken to peppering cloud emojis into various Instagram captions and responses, including one reply to Pete's comment saying, "Thanks for making this idiot from Staten Island the happiest boy on earth;" her reply included about 20 emojis. Ariana's no stranger to the world of celebrity fragrances; she has currently launched four perfumes to date: Frankie(a unisex scent named after her brother), Ari by Ariana Grande (a bright woodsy floral), Sweet Like Candy (a fruity-citrus concoction), and Moonlight, a gourmand floral. If we had to make any guesses based on packaging alone, we would surmise that her forthcoming eau might be an fresh, airy scent, possibly with notes of mint, basil, or fig. As for what all the cloud-themed references could mean? Perhaps she's on cloud nine with her new relationship and forthcoming Sweetener album launch, or maybe she's got a certain thing for moody, cloudy weather. Either way, we're sure that the scent will undoubtedly be another fan-favorite. Talk about having your head in the clouds - in the best way.